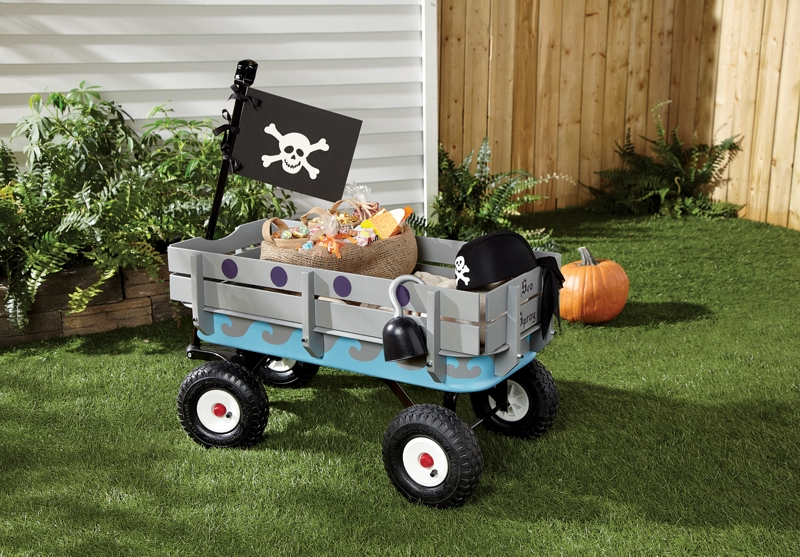 Paint a plain wagon with waves and portholes to create a trick-or-treat craft that any little pirate would be honored to pull. Discover more Fall spray paint projects from Krylon®. Protect the work surface with newspaper. Once dry clean with tack cloth again. Carefully remove the masking and set the wagon base aside to dry further. Mask off the Classic Gray portion that will not be painted. Let cure for 24-72 hours before assembling the wagon. 1 piece of 8 1/2" by 11" 3mm craft foam in black. Cut three one inch slits near one end of the black craft foam and attach the Jolly Roger to the wagon handle with three pieces of black ribbon.